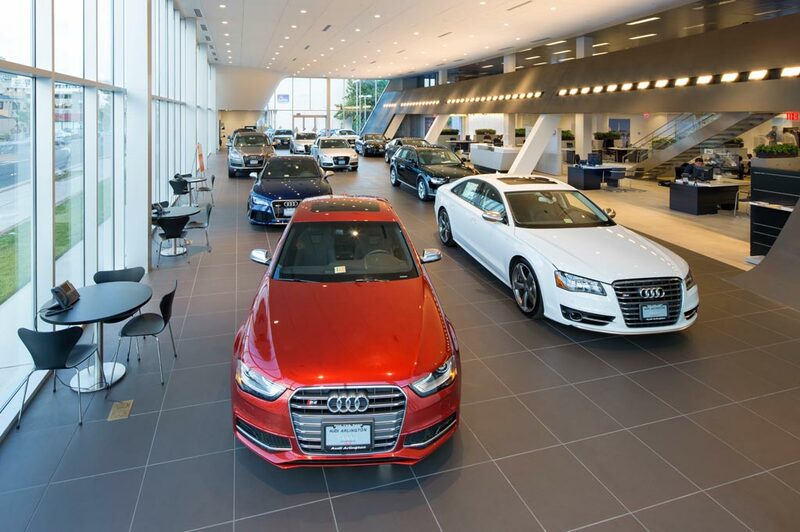 Audi Cary in Cary, NC treats the needs of each individual customer with paramount concern. We know that you have high expectations, and as a car dealer we enjoy the challenge of meeting and exceeding those standards each and every time. Allow us to demonstrate our commitment to excellence! Our experienced sales staff is eager to share its knowledge and enthusiasm with you. We encourage you to browse our online inventory, schedule a test drive and investigate financing options. You can also request more information about a vehicle using our online form or by calling (888)453-7016. Audi Cary proudly serves the greater Cary, North Carolina area with the best new, used and certified pre-owned Audi cars and SUVs. Conveniently located in Cary, Audi Cary serves other North Carolina cities such as Raleigh, Durham, Chapel Hill, Fayetteville and Pinehurst. The premier Audi dealership in Cary, Audi Cary offers the full line of new Audi models. New Audi sedans like the Audi A3, Audi A4, Audi A6, Audi A8, Audi RS3, Audi S3, Audi S4, Audi S6, Audi S8. New Audi coupes like the Audi R8, Audi RS5, Audi S5, Audi TT, Audi TT Roadster, Audi TT RS and Audi TTSw. New Audi SUVs, crossovers, sportback and wagons like the Audi A4 allroad, Audi A3 e-tron, Audi A7, Audi Q3, Audi Q5, Audi Q7, Audi RS7, Audi S5, Audi S7, and Audi SQ5. And new Audi convertibles like Audi A3 Cabriolet, Audi A5 Cabriolet, Audi S5 Cabriolet, Audi TT Roadster, and Audi R8 Spyder. If you live in Cary, Raleigh, Durham or Chapel Hill NC, shop Audi Cary for your next new Audi vehicle. Audi Cary proudly offers an impressive inventory of used and Certified Pre-Owned Audi cars for sale in Cary, NC like the Audi A3, Audi S3, Audi A4, Audi S4, Audi A6, Audi S6, Audi A7, Audi S7, Audi RS 7, Audi A8, Audi S8, Audi A8 L, and Audi A8 L W12. Used Audi coupes like the Audi A5, Audi S5, Audi RS5, Audi TT, Audi TTS and Audi R8. Used Audi SUVs, crossovers and wagons like the Audi allroad, Audi Q3, Audi Q5, Audi Q5 hybrid, Audi SQ5 and Audi Q7. And used Audi convertibles like Audi A3 Cabriolet, Audi A5 Cabriolet, Audi S5 Cabriolet, Audi RS 5 Cabriolet, Audi TT Roadster, Audi TTS Roadster and Audi R8 Spyder. Looking for a CPO Audi? Consider purchasing a Audi Certified Pre-Owned Vehicle from Audi Cary. Visit Audi Cary, a Cary NC Audi dealership, at 600 Auto Park Boulevard, Cary, North Carolina near Raleigh, Durham, and Chapel Hill. We also serve Pinehurst and Fayetteville. Call to request additional information about specific Audi Cars for sale in Cary, schedule a test drive or inquire about leasing and financing today 919-460-3800. Have Your Eye on a New Audi? Audi Cary, Serving Cary, Raleigh, Durham and Chapel Hill is the Place to be! We certainly don't blame you. The vibrant new Audi Q5, A3, A4, Q3 and A6 cars in our showroom serving drivers from Cary, Raleigh, Durham and Chapel Hill always bring style and performance to the table. In fact, with a wide-range of exciting Audi models available, it can be difficult to make a decision. That's where Audi Cary comes in; we're happy to review the details and answer any questions to help you discover the vehicle that best matches your lifestyle. No matter your preference, Audi Cary has plenty of Audi options to choose from. Our online inventory is constantly being dated with listings of vehicles available in our showroom, including the Audi Q5, A3, A4, Q3 and A6.What matters most, though, is your opinion, and which model grabs your attention. We believe the process should be as stress-free as possible, so relax, keep an open mind and try to picture yourself behind the wheel.. Interested in a pre-owned model instead? Well Audi Cary has you taken care of as well. We know that top-of-the-line quality and reliability are key selling-points for any automotive purchase, new or used. With that in mind, we work tirelessly to ensure all of our used cars measure up to our stringent standards before they make it onto our lot. Want to Talk Auto Finance? Here at Audi Cary, We're Ready to Help Drivers in Pinehurst and Fayetteville--Our service is worth the drive! So, you've found the vehicle you most desire. You want to go home in it. We want you to go home in it. But, all the details must be sorted out when it comes to financing. That's where our car loan and Audi specialists step in. We're here to help you by going over every option clearly, and will work hard to find the right plan for you. We want to make your dreams of ownership happen, and this is all part of the Audi Cary experience we strive for. Love our customer-first approach and unpretentious expertise? You're not alone. But don't worry. Your relationship with Audi Cary doesn't have to end after you've taken off in a new or used Audi. We remain committed to making sure your driving experience is satisfactory for many miles to come. That's why you can find all of the Audi parts you might need right here. If not, we can order them for you. Not only that, but to ensure your vehicle is in tip-top shape, our team of car service experts is here to provide all necessary repairs and routine maintenance. We could talk all day about everything we have to offer our valued customers here at Audi Cary, but truth be told, we would love to show your firsthand. We cordially invite you and your family to come visit us, any time, at 600 Auto Park Boulevard in Cary, NC . Whatever your automotive needs may be, we will work incredibly hard to meet them.